Let’s make a shrimp ceviche today. It’s light and delicious and awesome for a dinner party . . . you can make it the day ahead and serve as an impressive appetizer. I’ll be honest, this was inspired pretty directly by Mezcal Cantina, a prime example of the fine dining that surprises the Worcester visitor who isn’t scared away by gang warfare. Okay, I exaggerate, but that’s the unfortunate perception. This recipe has all the good, normal, safe ceviche stuff: cilantro, lime juice, shrimp, hot peppers (in this case, serrano), and red onion. 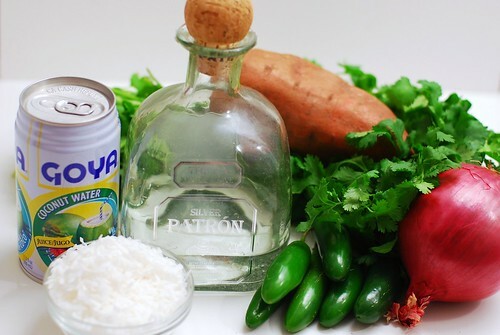 And then there are some extra ingredients that make it extra special: sweet potato, coconut juice (also called coconut water, and definitely NOT coconut milk, which is much thicker), toasted coconut as a garnish, and the big un: TEQUILA! Let’s get all crazy on this ingredient list. And the one ingredient I couldn’t fit in the same shot as the Patron. The tequila isn’t alcohol-y, the peppers give just a hint of spice, and the sweet potatoes are so uninterruptive to the flavour as long as they’re cooked enough. 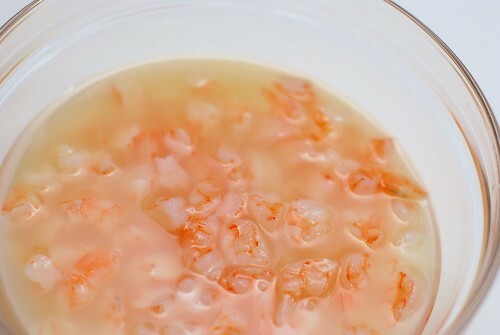 In a true ceviche the raw shrimp is “cooked” by the lime juice. 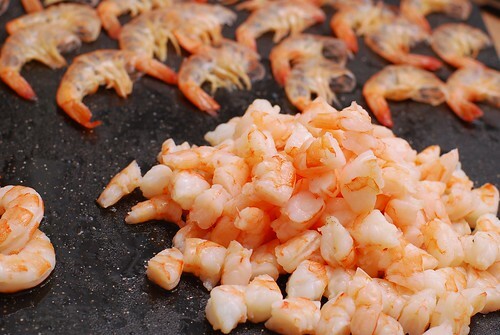 From what I understand, most shrimp is flash-frozen before it’s even off the boat, so this is probably a safe method. Even still, I feel a little weird about it, even though I know the texture is divine. So as a compromise, I lightly steamed them in their shells. Immediately chill to cease the cooking process. Now chop the shrimps in thirds. And anally arrange their shells in the background there. Steep in lime juice in your fridge for about an hour. Boil the sweet potato (I guess it’s also called a yam?) 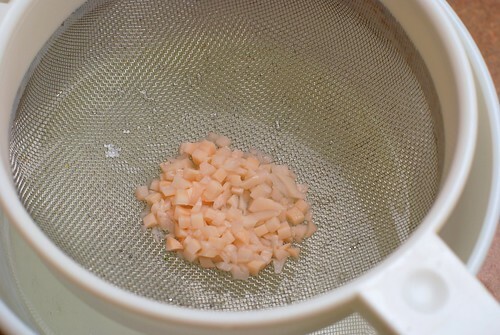 for 25 minutes, then chop into 1/4 inch cubes. Strain the coconut chunks out of the coconut juice. I see no reason not to leave it in, but the juice really does the job as far as flavour. And cilantro and serrano peppers and sweet potato and the coconut juice and of course, a shot of tequila. Chill that business for an hour as well. In the meantime, toast some coconut. And oh man, just look at that. It’s as delicately delicious as it looks. Promise. 1 shot tequila of your choice . . . and Patron is CHOICE! First, boil a pot of water, drop in a scrubbed sweet potato and let boil for 25 minutes. When it’s done, let it sit in a strainer for a little while to cool off. Bring a medium pot of water to a boil. 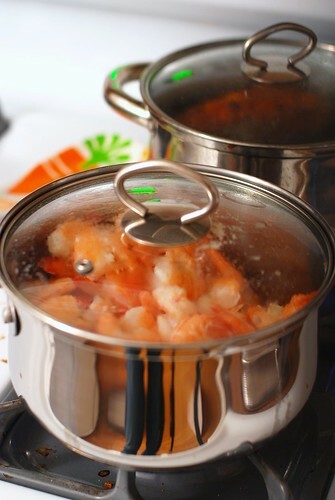 Drop the shrimp, leave it in there for about two minutes, then skew the lid and drain the pot, leaving the shrimp inside. Let steam in that manner for 8-10 minutes, depending on how nervous raw shrimp makes you. 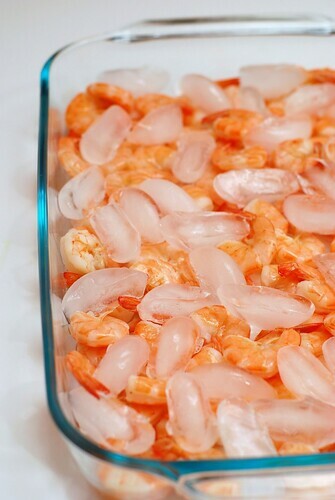 Pour shrimp into a shallow dish and litter the dish with ice cubes to stop the steaming. Once cool, shell and chop into thirds. 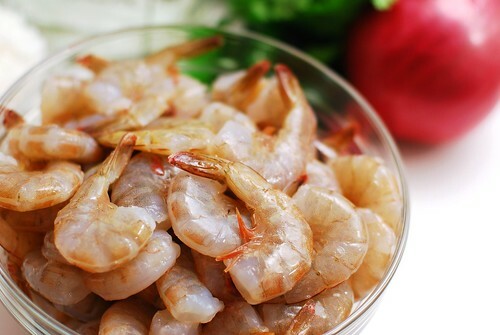 Put the shrimp in a bowl and cover with lime juice. Chill in the fridge for 1 hour. Finely chop the red onion, then rinse in a strainer; this seems to keep the flavour milder. Roughly chop 2/3 c cilantro. 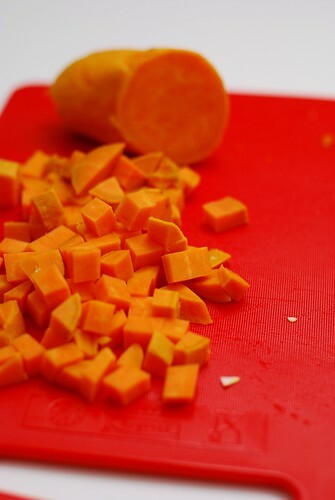 Cube half of the sweet potato into 1/4″ cubes, discarding any cubes that still have a crunch to them. Slice the serrano chiles in half, but don’t chop them up . . . they’re just lending flavour to the juice, we’re not putting these in our mouth. 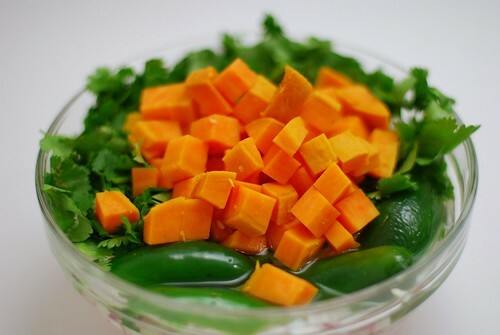 Strain the coconut water into a bowl, add the tequila, stir, and then add the onions, cilantro, sweet potato and chiles. Stir to mix, then fridge it for an hour. While you’re waiting the practically unbearable hour for all that stuff to mingle, clean your kitchen and toast the coconut. 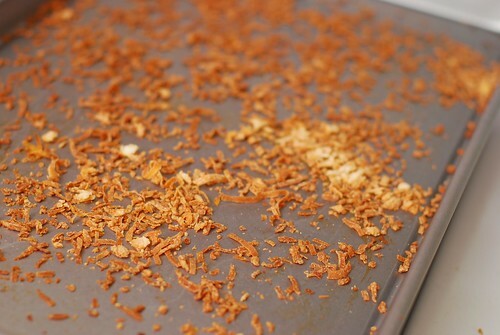 Sprinkle the flakes on a cookie sheet and place in a 300o oven for 5-10 minutes. They’ll look pretty browned, but you really just want to make sure they don’t outright burn. See the picture, this coconut was perfect. Strain the shrimp, reserving about 1/4 c lime juice. Throw the shrimp and the reserved juice in with the onion/cilantro mixture. If you’re really looking to impress, serve in a margarita glass. If you’re like me, who drinks iced margaritas out of pint glasses, serve in one of your three martini glasses. Either way, sprinkle with the toasted coconut, garnish with with some extra cilantro, and serve. Tasty and beautiful – great recipe. I’m intrigued w/ the source of this recipe. Hubby’s family lives in Worcester… will have to check out that restaurant! I’ll be bookmarking this for a warm summer day! This would go sooooo well with some margaritas out on deck. This looks terrific…although I have to say that the shrimp shells are kind of creeping me out! lol! Lo, RecipeGirl, Amanda – yes, it is a bit out-of-season, but it’s so low cal it’s worth it in the winter. I love ceviche, never made it with patron though. Will have to try that. Sweet potato and yam are two different root vegetables hun. Yams are a much tougher veg with dark brown skin and hard pale cream insides. Takes a bit longer to boil as well. Looks yummy. Can’t wait to taste it. You have excellent taste in Tequila (like Sabs). BTW, what size shrimp and how many will it serve? Just ran across your blog… love it! Someone just sent me your link and from the commenters above me, some of my friends share their enthusiasm for your food. 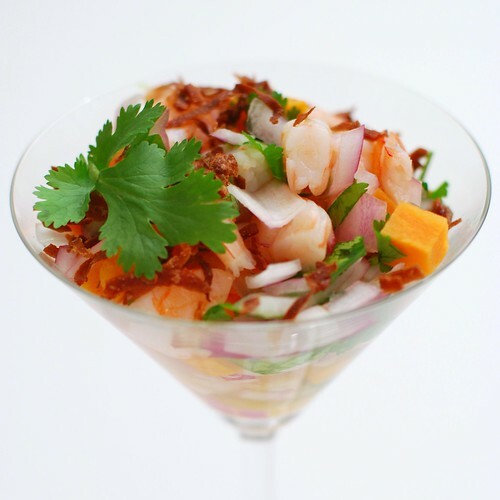 The blog, this ceviche and the humour are A-OK…I’ll be back! This looks amazing…will be trying soon! Amazing delicious shrimps, I am sure I will able to have a dozen glasses! Sweet Potato and Shrimp, what a perfect match. I am definitely going to try this out. Curious on how the textures compliment each other. Oh and Patron is a must.